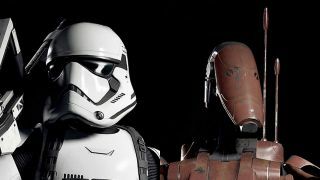 DICE's Star Wars Battlefront allowed players to heavily customize their troops as individuals, but the upcoming Star Wars Battlefront 2 is scaling that back a bit by introducing classes. No longer can any trooper use any equipment they've unlocked - instead, you'll be locked into a set of abilities focused around doing what your class does best, and that stays the same regardless of which era your soldier belongs to. Over on the PlayStation Blog, the concept is broken down a bit further, with the Heavy Trooper as an example. This class is all about overwhelming firepower and big guns, and has two primary abilities which support this. Combat Shield deploys a small... well, shield while you advance, and Sentry lets you wield a heavy weapon at the cost of limited movement. But the really interesting thing to note is that even though the armies you'll face off against in Battlefront 2 can sometimes be separated by decades, your class will always be the same. In other words, a Separatist Heavy Trooper will play the same as a First Order Heavy Trooper - the only changes are visual in nature. You'll still be able to customize things from there, but at least this ensures the playing field will remain even; just because you've got robot legs doesn't mean you'll move any faster than a Stormtrooper. For more on how Star Wars Battlefront 2 progression works, check out our break down. And if you haven't already, make sure you watch the E3 2017 trailer. It's good stuff.